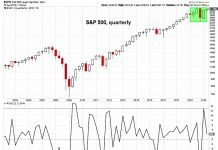 The S&P 500 (INDEXSP: .INX) finished higher by 0.05% and continues to have a strongly bullish intermediate posture according to the Market Forecast indicator. All major U.S. equity indices have strongly bullish intermediate postures and “3 Green Arrows” signals. The S&P 500, Dow Jones Industrial Average, and NASDAQ Composite (INDEXNASDAQ: .IXIC) all achieved multi-month intraday highs in today’s session. The Russell 2000 (INDEXRUSSELL: RUT) officially completed its “Golden Cross” as its 10 week moving average closed above its 40 week moving average on Friday’s close. It was the last of the major equity indexes to do so. Interest rates continued their march higher with the 10 year Treasury Yield now at 2.59%; notably, REITs finally started to react negatively to rising interest rates in today’s session after refusing to do so last week. Junk bonds have been outperforming government bonds as a result of crude oil strength and a general “risk-on” market sentiment. The U.S. Dollar bounced up and away from the 30 day moving average today; gold broke a key support area as a result. Russian stocks were up over 1% and broke out through resistance today; Israeli and German stocks also closed at multi-month highs. Health Care stocks were the worst performer today and also fell the furthest in Friday’s Sector Selector rankings. 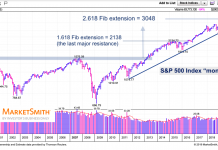 There continue to be several strongly bullish intermediate trends from a sector perspective including: Financials, Communications, Technology, Discretionary, and Staples. Our trade application example featured buying a long-term call option on Walgreen’s (WBA) now that its dividend yield is above 3% and is showing oversold cluster signals on a weekly candle chart; buying a call rather than the stock outright allows a trader to spend less money on the trade to defend against the possibility of WBA’s trend not reversing higher by the end of the year.